Nine walks of discovery around Thundersley in Essex. All walks will be published on this website soon. The Four Seasons Walking Group, An intrepid group of local walkers got together to experience these walks and beyond. Normally starting (and finishing for light refreshments) at the White Hart in Thundersley, some of their walks are described on our Four Seasons Walking Group page, and information about forthcoming new walks. 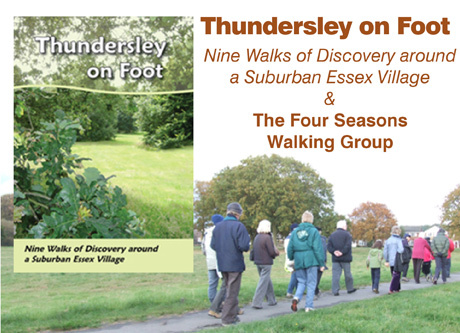 Guidelines are now available describing how Thundersley on Foot came about in the hope that we can encourage people in other neighbourhoods to produce their own ‘OUR TOWN on Foot’. It is a lot of hard work, but its great fun and helps to develop that neighbourly feeling. If you are thinking of producing a book for your area then phone Eileen on 01268 752264 for some encouraging words!.